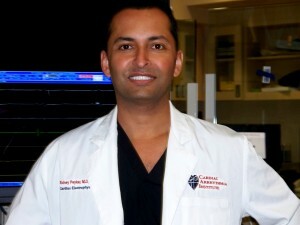 In July of 2007, Dr. Sidney Peykar began his practice of electrophysiology in Florida. Dr. Peykar spent considerable time and effort to establish the EP program including setting up equipment and training lab staff for complex arrhythmia ablation first in Charlotte County and then expanded his practice to Sarasota. His goal was to be the first to offer state of the art EP care for Southwest Florida. Prior to his arrival there were no physicians performing this procedure in Southwest Florida. Since then he has performed more than 2500 procedures and more than 1500 cardiac ablations. He is currently the electrophysiologist doing the highest volume of cardiac ablations on the west coast of Florida – from Tampa to Naples. He is perfoming about 10-12 atrial fibrillation ablations a week, and will perform more than 400 atrial fibrillation ablations this year. Dr. Peykar prides himself on offering not only technical expertise, but also a personal experience. A consultation with him involves aninteractive discussion about the causes of the arrhythmia, it’s possible solutions (both with medications and invasive procedures), and a frank discussion about possible risks. Patients rarely leave a visit with Dr. Peykar without detailed illustrations that he uses to clarify these issues. All procedures that Dr. Peykar recommends and schedules are performed by him personally. His lab team is trained to support the cases, but as Dr. Peykar says, “My hands are the only ones on the catheter.” While this may seem obvious, it is in sharp contrast to some of the academic centers that patients are often referred to, where a fellow in training is performing the bulk of the invasive procedure under a senior physician’s hands-off supervision.